We drove the Roadster to BHM and paid our deposit for a new 110 Plus Four. There is no build date info yet but the dye is cast. We have ordered it in Black with Suede Green leather, black weather equipment and alloy wheels in silver. We are looking at substituting an oil pressure guage for the clock and have asked for brake reaction bars to be fitted too along with double tread rubbers. We are having a think about a luggage rack and I must ask about an ally rad to be fitted as BHM had to replace ours whilst they we fitting the roll bar (of which they have made a splendid job) because rough cobbles in Arras caused the top spigot to crack. There is news of an improved manifold being developed. We would definitely want that. Lots to think about: excitement and nervousness in equal measure. BHM as always are so helpful and make really good tea. Congratulations, now the exciting wait begins. Congratulations Ian, brilliant news . Congratulations! Looks like you have a nice car there. Did you try the Plus8? Let me know when it's in build and I'll try to grab a photo or two. 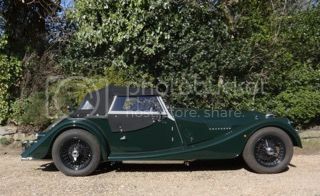 There is something very special about speccing a Morgan to your very own personal choices, great to hear to that you are going down this route. Agreed that partnering with BHM will enhance the process. I would very strongly recommend an alloy radiator, the standard "plastic" items seems have enjoyed rather too "mixed" a reputation to be ignored. We have ordered it in Black with Suede Green leather, black weather equipment and alloy wheels in silver.